Yes, our picture is completely ridiculous, but this actually did happen. 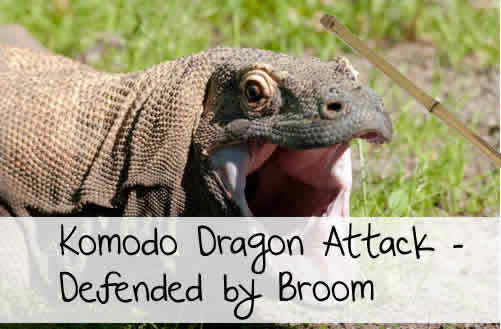 An 83-year-old Indonesian woman has used a broom to fight off an attack from a Komodo dragon. Komodo National Park official Heru Rudiharto says the 2-meter (6.5-foot) -long giant lizard bit the left hand of Haifha on Tuesday while she was near her house on Rinca island. Haifha hi the Komodo dragon several times with a broom until it let go of her hand. Her neighbors also assisted and helped scare the animal off. Komodo dragons are well known for their viciousness, size, and most of all poison bite. Komodo dragons often follow large animals for days biting and injecting venomous bites. A human on the other hand can die in a very short time and if caught quick enough can be treated, however many times the bites result in amputation.